Professional video equipment is our business. We introduced the first professional-quality character generator card for the PC in 1985. Now we design and build more than 30 products for television production and other commercial use. Whenever you need a switcher, a logo generator, a mixer, a fader, or some other device, call Burst Electronics. Many models come in S-video (Y/C, S-VHS, Hi8) and PAL versions as well as NTSC composite video. S-video format converters are also available. 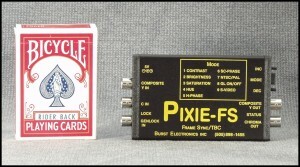 Our new multi-standard Pixie-FS Frame Sync / TBC is even better – it doesn't need a converter! All our products now carry a two-year warranty! Now we have digital amplifiers, switchers, generators, and more to go with our analog models! Our new model GPI-20 GPI to RS-232 converter offers twice the capability of the GPI-10 – 20 GPI inputs and 40 character string outputs. Our products are used for movie and television production and TV broadcast, but also by government and university research labs for purposes as unusual as displaying the temperature of an oven. Since many of our products use 12-volt power, you can take them mobile. Download the Burst Catalog now! See also our updated and expanded list of manuals and software. All video equipment and audio products are designed and built by Burst Electronics.